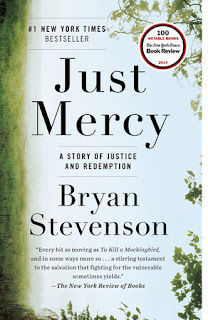 I recently had the privilege of reading the phenomenal nonfiction memoir Just Mercy by Bryan Stevenson. It truly was a privilege. This book is eye-opening, heartbreaking, and powerful. Just Mercy tells the story of Bryan Stevenson’s first years as a lawyer defending those on death row. In particular, it focuses on the plight of a wrongfully convicted man from Monroeville, Alabama. For those who think this town sounds familiar, it is the same town Harper Lee, acclaimed author of To Kill a Mockingbird lived and based her classic novel. Like To Kill a Mockingbird, the man wrongfully convicted is black and his accusers are white. Racial dynamics are central because of his relationship with a white woman. However, in addition to racial discrimination, there is also government corruption and prison abuse. Stevenson eloquently discusses the problems with our criminal justice system and the failings of our prisons. By providing an in-depth analysis, he presents information that the public often misses such as the number of children sentenced to life in prison and the statistics comparing the various races on death row. He also identifies the failings and lack of prison rehabilitation. He reminds readers of the number of those incarcerated that suffer from mental illness and drug/alcohol addiction. As soon as I started reading the introduction of Just Mercy, I told friends that it will probably be one of the best books I read this year. I was right. This book was illuminating and has forever changed my views. Good books teach us something, but the best books help us empathize with others. Just Mercy does both.